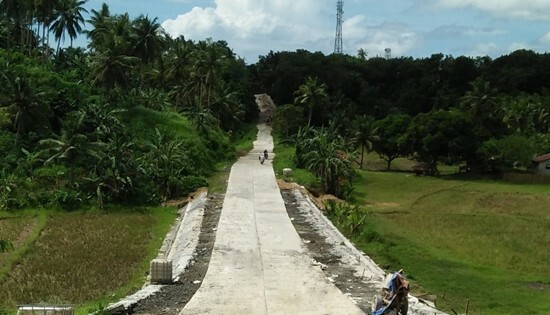 CALBAYOG CITY – Samar First District Engineering Office substantially completes the Construction of the Missing Gaps connecting to National Road, including Road of Way (ROW), located at Rueda Extension near North West Samar State University (NWSSU) campus. It is accessible by a 2-minute motor ride from the City Proper. The construction of 1.01 kilometer road project is implemented by DPWH-Samar I and is under contract with CDU Construction with a total appropriation of P40 million from the FY 2017 GAA Fund. It is directly beneficial to the residents and the students from far-flung barangays because it serves as a shortcut when they go to work and school. Farmers and motorists no longer have to endure a longer travel time as they can expect better traffic condition from now on. Mr. Renaldo Pactor, the caretaker of the NWSSU agricultural farm, said that this concrete road was a big benefit to them, because now their equipment and vehicle can pass through to transport their agricultural products and the students need not traverse through muddy land when going to school. The newly paved roads ensure the robust economic growth in the city as the transfer of agricultural goods and other products is hastened. QUEZON CITY – Workers’ group Associated Labor Unions-Trade Union Congress of the Philippines (ALU-TUCP) is demanding the Bureau of Internal Revenue (BIR) and Department of Finance (DOF) to return in cash an estimated P5 billion they unlawfully collected from minimum-waged workers nationwide for seven months back in 2008. The group insists a cash refund including its legal interests the collected money earned from 2008 to 2017. “We cannot understand why the BIR and the DOF is quick to squeeze money from the workers but it takes forever for them to return those. Mahiya naman kayo! Those are workers’ blood money. Pinaghirapan na yan ng mga manggagawa, ibalik na ninyo! said Alan Tanjusay, ALU-TUCP spokesperson. In its 56-page January 24, 2017 ruling, the Supreme Court nullified several provisions of BIR Internal Revenue Regulation 10-2008 that disqualify Minimum Waged Earners (MWEs) from tax exemptions on their wage, bonus, and other compensation benefits such overtime pay, hazard pay, holiday pay, and night shift differential pay including fringe benefits in excess of P30,000 including those who received their 13th month pay bonus. In other words, the BIR continued to collect taxes on the basic wage, bonuses and other benefits from millions of minimum-waged workers nationwide from June to December 2008 despite of a law exempting minimum-waged workers from such taxes starting July 6, 2008. The SC also directed the BIR to grant a refund or allow a refund through withheld tax adjustments or a claim for tax credits by those subjected by IRR 10-2008. “Some minimum-waged workers who were subjected to tax may have remained a minimum-wage earner up to this day but they cannot claim for tax credit because they are exempted from income tax. The SC ruling stemmed from petitions filed by lawmakers, individuals and labor groups including the Trade Union Congress of the Philippines (TUCP). QUEZON CITY – Environment advocates and members of people's movements marched to the Japanese Embassy to demand a stop to Japan’s Asian push for coal. Led by Sanlakas, the Center for Energy, Ecology and Development (CEED) and other groups, they denounced Japanese Prime Minister Shinzo Abe's promotion of fossil fuels and so-called “clean coal” to power ASEAN nations' growing economies. According to the groups, profit-seeking Japanese coal companies are riding on the ASEAN drive to further expand its economy by peddling dirty coal-sourced power as fuel for economic growth. According to Center for Energy, Ecology and Development (CEED) Legal Research Officer Atty. Avril De Torres, Japan has been making strides in securing and financing coal projects across Southeast Asian nations amidst the ASEAN and East Asia Summits. De Torres cited Japanese company Marubeni Corporation’s recent concession contract with the Vietnamese government to build the new 1,200MW Nghi Son 2 coal-fired power plant in Vietnam. She also claimed that Japan is currently the biggest public financier of the Asian coal power plan – leading other major countries such as China, Korea, and Germany. According to De Torres, the Japan Bank for International Cooperation (JBIC) has been making huge investments in the Asian coal expansion, financing, most recently, Vietnam’s Nghi Son 2 coal-fired power plant and Indonesia’s Cirebon 2 coal-fired power plant. “Japan persists in its push for more coal in the region amidst peoples and civil society organizations’ plea to cease carbonization,” said Atty. De Torres. “Vietnam and Indonesia – two of the most climate-vulnerable countries in Southeast Asia – are forced to host more Japan-backed coal. Indonesia’s Cirebon 2, for instance, has recently received Japan’s coal finance despite court revocation of its environmental permit,” added De Torres. Sanlakas Secretary-General Atty. Aaron Pedrosa slammed Japan Prime Minister Shinzo Abe’s aggressive campaign for coal, including the “clean coal” push, claiming that it is mired with lies about the true impacts of coal. “‘Clean coal’ is an oxymoron and a dirty lie. Coal simply cannot be scrubbed clean of the long history of suffering it has caused on the people and environment,” said Sanlakas Secretary-General Aaron Pedrosa. Pedrosa cited 960 annual premature deaths found to be due to coal emissions in the Philippines alone, along with other economic and social issues stemming from the coal industry. He claims that “clean coal” has little difference with traditional coal. “‘Clean coal’ technologies still produce the same damaging amount of emissions and pollution. Their only difference with traditional coal is that they are more expensive for the countries that can’t afford them,” said Pedrosa. “Far from being a tool of development, any and all coal expansion within the region ensures profit only for the few coal companies, and traps climate-vulnerable regions like Southeast Asia into further poverty and climate change-induced suffering,” he continued. According to Pedrosa, the energy demand of Southeast Asia’s economic development must not be met through the use of dirty fossil fuel energy, given the losses that coal’s environmental impacts entail. “Whatever semblance of economic growth Southeast Asia currently enjoys will be undone by the climate change effects of continuous fossil fuel burning,” said Pedrosa. “Projections of climate change-caused economic losses in Southeast Asia include a decline of up to 50 percent of rice yield potential by 2100 and a loss of 6.7 percent of combined gross domestic product (GDP) each year by 2100,” said De Torres. Pedrosa stressed that Japan’s coal push is regressive instead of spurring genuine development. “If a technologically advanced society like Japan truly cared for the development of the Southeast Asian peoples, it must divest from all support from coal and instead put its money and expertise on sustainable and accessible sources of energy like renewables,” stated Pedrosa. De Torres highlighted renewable energy’s steady trend of decline in costs, citing it as a manifestation of renewables’ increasing viability as the next energy source after an obsolete coal. “Southeast Asia is ripe with renewable energy sources, like solar and hydro, which the most climate-vulnerable of its people have easier access to. Compared to a coal-backed economy, development that is founded on clean and sustainable energy is development that is sustainable and resilient,” said De Torres. Most Rev. Isabelo C. Abarquez, D.D., Bishop Diocese of Calbayog hands over the certificates to the Class President of Class 463-17. CAMP LUKBAN, Catbalogan City – The 8th Infantry (Stormtroopers) Division, Philippine Army spearheaded the Closing Ceremony of the Candidate Soldier Course Class 463-17 and the Ceremonial Entrustment of Firearms held at 8ID Jungle Base, Camp Eugenio Daza, Barangay Fatima, Hinabangan, Samar on November 15, 2017. The closing ceremony was graced by Most Rev. Isabelo C. Abarquez, D.D., Bishop Diocese of Calbayog as the Guest of Honor and Speaker who further led the ceremonial entrustment of firearms, distribution of certificates and awarding of individual achievements. The entrustment of firearms to the newly enlisted privates symbolizes their responsibilities and commitment to the people and the country. The majority of the new privates came from Eastern Visayas and Mindanao. On their educational profile, 19 of them are college graduates; 44 are college undergraduates and; 91 are high school graduates with skills training from TESDA. The privates were declared graduates by Lt. Col. Alexander N. Salgado, Commandant, 8DTS for having completed the Basic Military Training (BMT) at the 8th Division Training School. Bishop Abarquez also extended his profound congratulations to the proud parents who gave their all-out support to their sons in order to hurdle the training for enlistment to the regular force of the AFP. In behalf of the Commander, 8ID, Col. Clifford Cyril Y. Riveral, Assistant Division Commander for Reservist and Retiree Affairs challenged the members of Candidate Soldier Class 463-17 to take advantage on the gains of their training and exert much effort, to achieve more towards accomplishment of their respective unit’s mission thereby contributing to the overall mission of the Army. In his message, Bishop Abarquez said that the progress and development of our country depends on what our attitude towards our work. We should see our work as a real service to our country, to be good citizens of our country. You just have to do well what is expected of you. Be good citizens, be good breed of soldiers. Use your profession for the greater glory of God and be productive for our country and community. He likewise reminded the new breed of soldiers that no matter where they may be assigned, they should never forget to pray and to ask guidance from the Almighty Father. Hon. Gemma P. Zosa, Municipal Mayor of Sta. 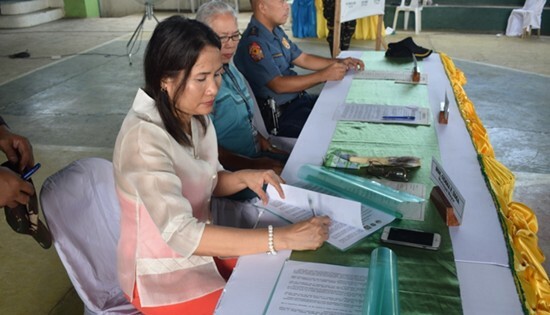 Margarita, Samar signs the Municipal Resolution #43, declaring Sta. Margarita, Samar as Stable Internal Peace and Security Condition. 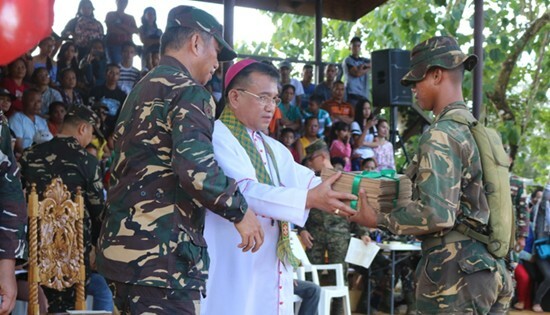 CAMP LUKBAN, Catbalogan City – The 803rd Infantry (Peacemaker) Brigade and the 43rd Infantry (We Search) Battalion in partnership with the local government of the Municipality of Sta. Margarita, Samar and Samar Police Provincial Office (SPPO) jointly declared the Municipality of Sta. Margarita, Samar as “Stable Internal Peace and Security Condition” on November 13, 2017 at the Municipal Covered Court, Sta. Margarita, Samar. The highlight of the event was the reading of the declaration as stated in the Municipal Resolution #43, s2017, reading of the Memorandum of Agreement (MOA) and the signing of the Pledge of Commitment by Hon. Gemma P. Zosa, Municipal Mayor of Sta. Margarita, Samar. Other present during the activity were: Brig. Gen. Mario G. Lacurom represented by Col. Emmanuel B. Magpayo, Deputy Brigade Commander, 803rd Brigade; PSSupt. Nicolas D. Torre III, Provincial Director, Samar Police Provincial Office represented by PCI Zaldy A. Cagampang, OIC, Sta. Margarita MPS and were witnessed by the following personalities: Hon. Simplicio D. Galidbo, Jr., Municipal Vice-Mayor; Rev. Fr. Dionesio M. Calderon, Parish Priest of St. James the Greater Parish; Maj. Jay C. Pascua, OIC, 43IB; Ms. Rhea T. Obeseñares, NGO; Mrs. Germana B. Mananguite, MLGOO; Hon. Ricardo C. Nerio, ABC President; and Mr. Carlito T. Arambala. In their message, both invited guest speakers gave emphasis on winning the peace by strong collaboration with different stakeholders and community. In his message, Brig. Gen. Lacurom called for unity and affirms their commitment to exert effort, cooperation, preserve and sustain the municipality as free from insurgents towards the attainment of peace and development. Assistant District Engineer Alfredo L. Bollido (left) as he shows the Registration Certificate and Registration Schedule to all employees during the Flag Ceremony last October 30, 2017. 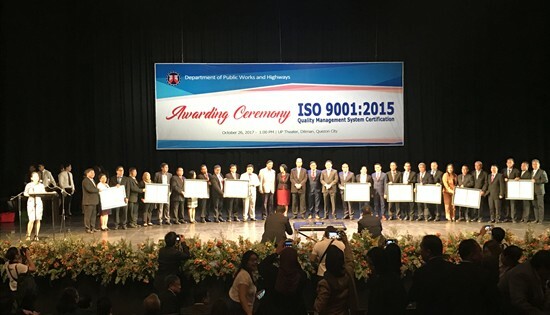 NAVAL, Biliran – The Department of Public Works and Highways - Biliran District Engineering Office (DPWH-BDEO) has recently been certified with the International Organization for Standardization (ISO) 9001:2015. Having been assessed by the AJA Registrar and found out to be complying to the requirement of the standardization process. ISO (the International Organization for Standardization) is a worldwide federation of national standard-setting bodies (ISO member bodies). The work of preparing the International Standards is normally carried out through ISO technical committees. Each member body interested in a subject for which a technical committee has been established has the right to be represented on that committee. International organizations, governmental and non-governmental, in liaison with ISO, also take part in the work. ISO 9001 is the international standard that focuses its requirements for a quality management system (QMS) including a strong customer focus, the motivation and implication of top management, the process approach and continual improvement. Organizations uses these standards to establish themselves as providers of quality products and services that meets the customers satisfaction. According to Assistant District Engineer Alfredo L. Bollido, ISO 9001:2015 will be delivering many benefits to the office. These benefits are enhancing continuous improvement of the organization, leadership, managing risks, performance measurement and integrated approach. He also added the 6 Mandatory Documented Procedure (i.e. Control of Documents, Control of Records, Internal Audit, Control of Nonconforming Products, Corrective Action and Preventive Action) and the 5S Method (i.e. Sort, Straighten, Shine, Standardize and Sustain). Through the leadership of our District Engineer, every Section Chiefs and its staff have cooperated with each other efficiently. The process on implementing projects has been improved and meets the deadline without compromising its quality. QUEZON CITY – The Southeast Asian Working Group on Climate and Energy, composed of members of civil society organizations and people's movements across Southeast Asia, denounced what they claimed to be an evident collusion between leaders of ASEAN, East Asia, and the United States of America, in their push for the coal agenda within the climate-vulnerable region of Southeast Asia. According to the Working Group's head convenor Gerry Arances, huge corporations and developed countries like the United States (US) and Japan, have zeroed in on the region as an economy ripe enough for hosting a number of their investments on the expansion of coal – an energy source long called out by environmentalists and affected communities as the dirtiest, most destructive energy source there is. "The realities of destructive coal have not stopped ASEAN, US and East Asian leaders’ ASEAN coal push," said Arances. Arances said that ASEAN leaders, sanctioning the increase of coal use in their local region and welcoming more coal investments from across the globe, have branded coal as the key to further ASEAN’s economic growth. Meanwhile, according to one of the Working Group's convenors, Glenn Ymata, the US and East Asian countries, like Japan, ride on the ASEAN coal frenzy by promoting more coal projects within the region, echoing claims made by the region’s leaders that coal is the key to power development. "Corporations in the Donald Trump-led US have encouraged more coal mining on US lands. Coal extracted from these lands are to be marketed as 'cheap and reliable' energy for 'power-hungry' countries such as those in Southeast Asia," explained one of the other Working Group's convenors Atty. Aaron Pedrosa. On the other hand, corporations in a Shinzo Abe-led Japan have successfully pushed for the Prime Minister to promote coal as the succeeding primary energy source within and outside of the country, as explained by Center for Energy, Ecology, and Development Legal Research Officer Atty. Avril de Torres. "Supporting the US’ Asian coal push and building on its reputation as a technologically-advanced society, Japan has recently peddled its clean coal technology to ASEAN countries," said de Torres. WALHI's (The Indonesian Forum for Environment) Dwi Sawung stressed that the myth that coal could be clean is threatening to further boost coal's status as the region’s main energy source. "We stress that clean coal has time and again been debunked as a dirty lie. Clean coal is currently too expensive, especially for the poorer countries in ASEAN, and will take years before reaching a viable economic price," said Dwi. According to Dwi, even at a competitive price, clean coal is inefficient with reducing the emissions that traditional coal combustion releases. "Clean coal’s air pollution control technologies, while promising to capture hazardous air pollutants released by coal, are merely stored in ash dumps or unlined waste ponds that poison surface and groundwater," continued Dwi. Ymata states that these setbacks of “clean coal” do not even begin to account for the environmental degradation caused by all coal – whether “clean” or not – during the rest of the coal life cycle. "Even “clean” coal implies environmental and social costs, taking into account the effects of coal mining, preparation and transport," said Ymata. "We denounce these coal policies as an explicit and dangerous denial of the climate effects of coal and the urgency of responding to the issue of climate change," he continued. "It is evident that the aggressive coal push being fed to an already climate-vulnerable Southeast Asia is nothing more than a crusade of corporate interests," added Atty. Pedrosa. According to Pedrosa, this denial is poised to cost more lives from the people of a climate-vulnerable ASEAN, in service of the few corporate interests dominating the countries that insist on the proliferation of destructive and outdated coal. "Coal-affected communities, environmental advocates, people’s movements and organizations have repeatedly debunked the myth of coal as a “cheap”, “reliable”, and “clean” energy source," said Atty. De Torres. "The simple reality is that coal as an energy source has long become a thing of the past. It is irredeemable in the environmental degradation that it causes," stressed Sawung. According to Pedrosa, when an increasingly warming world is on a race to reduce its emissions, building new coal plants and developing technology to make coal more palatable provide little environmental and economic sense – especially in the face of abundant, more sustainable alternatives. "There is already a solution to meet the world’s energy needs without compromising the environment," explained Atty. De Torres. "Development that resonates with the people, especially the most climate-vulnerable, is one that is powered by renewable energy sources," she continued. "Unlike coal, renewable energy is sustainable and clean of carbon emissions that doom us into severe global warming. Renewable energy is also much more accessible to the people – making it more inclusive and responsive to the people’s developmental needs, instead of huge corporations’," said Dwi Sawung. "It is only a matter of whose interests our world leaders choose to serve," stressed Arances. Arances said that the Working Group denounced President Donald Trump, Prime Minister Shinzo Abe, and other coal proponents for selling to climate-vulnerable countries the dangerous myths that surround coal which he claimed to have spelled and will continue to spell countless deaths of climate-vulnerable people. "We call for these coal leaders to back off of Southeast Asia with their deadly coal agenda," said Arances. "We denounce ASEAN leaders for colluding with rich coal proponents in promoting coal and neglecting the climate-related suffering that has mired the nations of their region throughout history," added Atty. Pedrosa. The Working Group demanded ASEAN leaders to stop using, investing in, and financing coal as a means to power Southeast Asian economic development, to reject all coal projects offered by the US, East Asia and other prominent coal proponents, to use the Southeast Asian region’s moral and political position as a climate-vulnerable region to call out and condemn developed countries' coal push, and to demand from these countries their equitable share in climate change mitigation. Finally, the Working Group also stressed on their demand to invest in renewable energy as a path to a people-centric development, and to pursue a development that, "resonates with the people from the ground instead of that which only resonates with corporate and developed countries' interests." QUEZON CITY – "Since its establishment in 2009, the ASEAN Inter-governmental Commission on Human Rights (AICHR) has addressed a grand total of zero pressing concerns on human and people’s rights in the Philippines such as the killings and attacks against human rights defenders and indigenous peoples, killings in relation to the drug war, bombings and forcible evacuation of communities especially with the martial law declaration in Mindanao,” said Cristina Palabay, Secretary General of Philippine-based human rights organization Karapatan, in the sidelines of a parallel gathering of non-governmental organizations to the 2017 Summit of the Association of South East Asian Nations (ASEAN). Palabay said that even after the Philippine government’s signing of the ASEAN Human Rights Declaration in 2012, the human rights situation in the country has worsened. “It is foolhardy to expect concrete actions and strong recommendations from the ASEAN regarding the human rights situation in the Philippines, when, for a long time, its human rights body has been rendered inutile and toothless in the protection and promotion of international human rights principles in the region, especially at a time of worsening attacks against people’s rights in South East Asia,” she explained. Numerous human rights and people’s organizations have raised alarm and concern on the extrajudicial killings in line with Philippine President Rodrigo Duterte’s drug war. Under Duterte, Karapatan has recorded 98 killings of peasants, indigenous peoples, workers and human rights defenders, in accordance with the counter-insurgency program of the military. Nearly half a million Filipinos have forcibly evacuated from their homes due to aerial bombings with the martial law declaration in Mindanao and the government’s all-out war. “Not a single critical word was heard from other ASEAN member states during the Universal Periodic Review of the Philippines at the UN Human Rights Council,” she stated. Karapatan said Duterte’s latest remarks on holding a global human rights summit is one big joke. “All States, especially the Philippines and the US, are being made accountable by peoples in various arenas and platforms. Duterte’s proposed summit may just be another laughable and yet sordid display of fascists and hypocrites spitting on people’s rights,” Palabay said. “The AICHR should act decisively to address the urgent concerns of peoples in South East Asia now, lest it fully exposes itself as another inter-governmental body that deodorizes governments such the Philippines, which are among the most notorious human rights violators in the world,” she concluded. 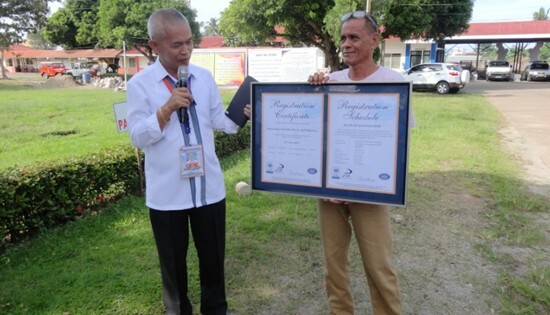 CALBAYOG CITY – Vice-President Paul B. Bagatsing of the Anglo-Japanese American (AJA) Registrars Inc., which conducted an audit on the DPWH Quality Management System, awards the ISO 9001:2015 certification to DPWH Secretary Mark A. Villar and heads of the Regions, Services and District Offices in a ceremony held last October 26, 2017 at the UP Theater in Diliman, Quezon City. ISO Certification is an accreditation conducted by external certification bodies to ensure that the performance of an organization’s inter-related processes and activities are in line with international standards. During the event, Mr. Bagatsing delivers a congratulatory speech by quoting Thomas Isaac Robin, “happiness does not come from doing the easy work but from the afterglow of the satisfaction that comes after the achievement of a difficult task that demanded your best”. He also gave a task to the DPWH to better their best for the future. Secretary Villar then departs with a message encouraging the awardees to go further by creating a new standard that is beyond the accomplishments of the past in order to provide a higher level of service for the country. District Engr. Alvin Ignacio receives the award on behalf of DPWH Samar First and presents it to the Section Chiefs during their regular staff meeting last October 30. He informs them that the ISO certification is an advantage since transactions and processes for customer and contractor relations will become faster and more streamlined through the improved system. DE Ignacio reminds all to put into practice the words of Mr. Bagatsing and Sec. Villar in the aspiration to reach new heights in public service for the benefit and betterment of the life of every Filipino.